Blood Sugar Balance contains benfotiamine, a relative of thiamine shown to promote healthy blood glucose levels. Blood Sugar Balance contains 2 powerful ingredients shown to help improve glucose metabolism: benfotiamine (an underappreciated form of vitamin B1 shown to lessen damage from high glucose levels) and alpha lipoic acid (an antioxidant that may lower blood sugar). Benfotiamine has been used as a diabetes medication in Europe to treat elevated blood sugar and diabetic complications like neuropathy. 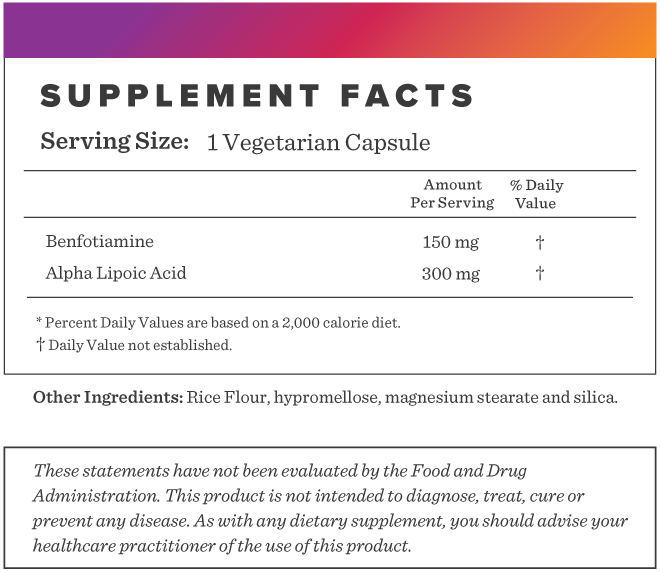 Alpha Lipoic acid (ALA) has been shown to increase the feelings of hunger, which may aid in weight loss. The combination together supports normal glucose metabolism, healthy weight and neurovascular health. 1. Fraser DA, Hessvik NP, Nikolic N, et al. Benfotiamine increases glucose oxidation and downregulates NADPH oxidase 4 expression in cultured human myotubes exposed to both normal and high glucose concentrations. Genes Nutr. 2012;7(3):459-69. 2. Haupt E, Ledermann H, Köpcke W. Benfotiamine in the treatment of diabetic polyneuropathy--a three-week randomized, controlled pilot study (BEDIP study). Int J Clin Pharmacol Ther. 2005;43(2):71-7. 3. Streeper RS, Henriksen EJ, Jacob S, Hokama JY, Fogt DL, Tritschler HJ. Differential effects of lipoic acid stereoisomers on glucose metabolism in insulin-resistant skeletal muscle. Am J Physiol. 1997;273(1 Pt 1):E185-91. Below we've broken down the main functions of our Blood Sugar Balance and the benefits it can provide. Research has shown benfotiamine to be beneficial for increasing glucose oxidation and uptake. Benfotiamine has been shown to improve neuropathy scores and decrease pain by preventing high blood sugar levels that damage nerves and blood vessels. One study showed alpha lipoic acid (ALA) can reduce blood sugar levels in diabetics by up to 64%.